There's a mismatch between what you read about in the papers and the debates on capitol hill about the VA and the day to day reality of people who work in the VA. From congress what you here about are wait times to see a doctor. But from many (not all) veterans, you hear about a system that works, a system that's less physician-centric than the private sector, and a system that outperforms other systems in terms of quality of care. HERSA did a study that showed that 55% of America's counties, all of them rural, have no psychiatrists, no psychologists and no social worker. None. So, you privatize mental health care, there is no place for you to go. The RAND did an independent assessment for the VA Commission on Care. They said there's no specialists in many areas where there are wait times and shortages for patients to access. Primary care is a huge problem in the United States. The U.S., unlike other industrialized countries, produces maybe, 15-20 percent primary care providers in its medical education system. There's a huge primary care shortage. I'm very worried that if we start channeling more veterans into the private sector, that this is going to put a strain on the systems. You're going to pit veterans against civilian patients. That will be very true in rural areas if some of the proposals that are in Congress see the light of day. They are proposing to offer higher than Medicare rates to providers in rural areas. If your Joe doc, and you could see Joe Smith, non veteran out there, you'll make 10 bucks less and then you can see James White, veteran. Pretty soon, the veterans are going to push out the [non-veterans]. That could be a very nasty picture. Alex: Our guest today is Suzanne Gordon, who's an award-winning journalist and her recent book is titled The Battle for Veterans' Health Care. She's won a number of different awards. Most recently the Disabled American Veterans Award. Welcome to the GeriPal PodCast. Suzanne: Thank you for having me. Alex: Thank you so much for joining us. Eric: Do you have a song for Alex to sing us? Suzanne: Have you ever seen the rain? Alex sings “Have you ever seen the rain?” by John Fogerty. Eric: Nice. Welcome and thanks for joining us today. You've been quite an advocate for the VA system. Before we go into your book ... It's called the Battle for Veterans' Health Care. Where again, can we find this? Suzanne: You can find it on Amazon. You can find it anywhere you can find books. It's actually, I think, on Barnes and Nobles, Amazon, Cornell University Press website. Eric: We'll have a link for that on GeriPal website. How did you get interested in the subject? Suzanne: I've been writing about health care, mostly private sector health care, for about 35 more years. I'm a journalist, a proud graduate school dropout from French literature who dropped into journalism. I started writing about health care about mid-way through my career. Wrote a lot about nurses, about teamwork, patient safety, health care systems and edited a book series for Cornell University Press, called The Culture and Politics of Healthcare Work series. I've written, I think this is my 19th book. I've published 35, that mostly other people have written. I've edited and acquired. I got to be familiar with the VA Health System about 10 years ago when I did some consulting for the VA around teamwork. They asked me to consult on some units that were having some teamwork problems. I did some teamwork workshops and was really impressed by their interest in teamwork when it was really not being promoted enough, in private sector hospitals and healthcare systems. I was very impressed with what I was seeing as the standard of care and the accountability of the VA. It was very clear to me when I was hanging around some of these units, that if patients didn't get the care they wanted on time, people would go to their congressman. There would be a congressional investigation or some sort of action, and accountability and change. As someone who has been a patient and a researcher of private healthcare systems, good luck with that! Eric: In the private health care system? Suzanne: Yeah. We can get to that later, but nobody who's looking at the VA is asking the critical question, "Compared to what?" Are there wait times in the VA? Well, yes there are, but compared to what, in the private sector? What is care compared to mental health care, compared to what? Palliative and geriatric care, compared to what? I'm going through some things with some friends whose loved ones are dying in other health care systems. Very good health care systems. I have spent a lot of time with palliative care, in the VA, with some people in this room. I'm not seeing those kinds of conversations happening, that kind of advice. I'm seeing patients, really, being tortured to death. I call it the George Washington death. It's taking longer than poor George Washington, who mercifully, it only took them a day to kill him. What I saw in the VA when I started doing some consulting, about 10 years ago, was really interesting to me. Then fast forward to 2013, 2013 and I met VA internist, primary care provider, Rebecca Shunk. I was doing some work at the ECFS Center for Innovation and Professional Care. I was doing some faculty teaching on teamwork. I met Rebecca because we did a session together on doctor, nurse relationships. She was telling me about what was going on at the VA, in terms of teamwork. I was really impressed because, I've been doing this for a long time in the private sector and you're lucky if they give you two hours of team training. You can't call two hours, training introduction. I was really impressed with what Rebecca was telling me. I think I might have come over here. I can't remember. Just a whole bunch of things. I had also know the head of patient care services at VA central office, Roz Jane, who did the MRSA bundle in the VA and reduced MRSA by recruiting people who were housekeepers and transport workers and nurses, and not just physicians. I was extremely interested in that. There were just a whole bunch of things that came together. I thought to myself, why don't I write a book about VA healthcare. Eric: Specifically, The Battle for VA Healthcare ... So, we have the nation's largest integrated health care system. In your book, you say, 70% of American physicians actually train in this system. It's an incredible place for research, clinical work and education. Eric: Is it a threat? Suzanne: ... wait time issues. Then the people that want to privatize the VA took advantage of that. There was just this assault that was being launched on the VA by mostly the Koch brothers and their conservative funded group, The Concerned Veterans for America. So I started writing about that while I was doing this parallel work, looking at VA clinical care and innovation. I come out of a session where I would see this incredible PT in the home of a veteran with dementia, creating all these ways for his family to take care of him. I turn on NPR or CNN and it would be like, the VA is awful. It would be like having a parallel universe. Suzanne: I traveled all over the country. I've been to VAs all over the country, although, I've spent the most time at Fort Miley, in San Francisco and also Martinez and various other places. 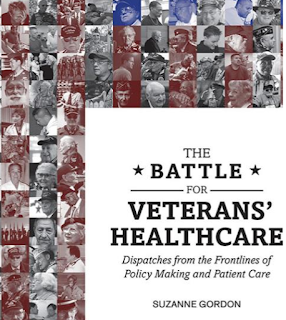 What happened was, while I was writing this larger book, I decided that I needed to spin off a smaller book, that came out sooner, about the battle for veterans healthcare. The whole politics about why the nations' largest and fully integrated, publicly funded, healthcare system is under attack. Eric: So, when you use the words, Battle for Veterans' Healthcare, who's in the battle? Who are the sides? Who are the participants? What's at stake? Suzanne: That's a very good question. I think that the sides are some very wealthy, conservative, even more than conservative, funders and industrialists, and a lot of hospital's CEOs, big pharma, a lot of corporate interests. They would like to get their hands on whatever it is, $70 billion, depending on the year, pie, pot of gold, that is being spent on veterans' healthcare. Very judiciously, with excellent outcomes. They would like that money. You also have people who don't like government, want to shrink government, who really are almost offended by the idea that a government program could work. They don't want alternative models of care of delivery. They don't want alternative models of financing. I would argue, that they don't really want alternative models of ethical and moral motivation and incentives. One of the battlegrounds is this idea of, you have to have people compete with the private sector. You have to have people running after money, in order to be motivated. I think in the VA, you see a really different sense of motivation and incentives. Eric: On the other side of that battle, other than you, that's written this book, who are the other participants? Are there other groups, not just politically, but of Veterans who are speaking out in favor of all of the good work that is happening within the VA healthcare system? Suzanne: Absolutely. There are veterans service organizations that are real veterans service organizations as opposed to the Concerned Veterans for America. They don't have any members. They don't deliver any services. They're not a veterans service organization. There's some other veterans organizations like Iraq and Afghanistan Veterans. The IAVA, which is kind of a hybrid group because they don't ... They do more fundraising than they do service delivery, although, they do deliver services. There's a really great group that started in San Francisco called, Fighting For Veterans Healthcare, FFVHC.org. They've just put out a really interesting policy analysis, that you can find on their website, of all the proposals that are now circulating in Washington about the VA. They analyze the impact of those proposals. There's Veteran's Caregivers. I think there are a lot of people out there, I've been trying to convince to pay attention to this, that are fighting for rationale healthcare in America, for national system of some kind, that goes under the name of single payer. The VA is the nation's only single- payer healthcare system. It's not a pure single payer system, but it's our only social healthcare system. It's a social justice system, and so forth. I think that it's an interesting question because the sides are poorly drawn, in a way. A lot of people who would be for the VA, don't really know much about the VA. There's a lot of Veterans' that don't see the breadth of the VA. I've been writing this book for four years because every single time I hear about another program, it's like, "Oh my God. I have write about that. Oh, I found out about that. I have to talk to this person and that person." Eric: You actually start off with a story of home based primary care where you actually go out on a visit with a physical therapist. Is that right? Suzanne: I have been on may home based visits. In houses of ... You go to the veterans' house and this physical therapist was fixing up the house of a veteran who had dementia. A Korean War veteran, I believe he was. She went into the house and did a top to bottom rehab of the house. I've been on many home care visits. Home care is really a very important aspect of healthcare that the U.S. healthcare doesn't do well. Other healthcare systems ... I once had pneumonia in France. I called up and, "Should I go to the doctor?" "What do you mean, come to the doctor? You're sick. What an idea! You should leave your house and come ... No! We'll come to you." It was like, "Stay in bed." Eric: Is there though, an argument for the other side? There are issues with the VA system. What do see as the big missteps for the VA? Are there? Suzanne: Of course. Any healthcare system has problems. If you look at UCSF or Sutter or Kaiser, you'll see some of the same problems. The problems the VA has is obviously, there have been some wait times. There are people who are not wonderful. I've encountered people in every healthcare systems that I've ever researched, that ... Why did you become a doctor or nurse? You should be in Silicon Valley with computers. You shouldn't be with human beings. The question really isn't, "Does the VA make mistakes? Does the VA have some bad apples? Does the VA have people that could be kinder and gentler?" The question for any healthcare system is, "What do you do with that? How do you deal with your mistakes?" The VA is a public system, those mistakes become public and somebody is forced to do something about them. Is there an argument that the VA makes mistakes? Yes. Is there an argument that the mistakes should be dealt with by privatizing and dismantling the system? There is no argument for that. There's only a counterargument. The counterargument is that the private sector is not equip to handle the complexity of the very particular problems people have when they enter the military at age 18, and prepare for battle, even if they never go in to battle. I think the VA has developed over 70 years. We as American citizens have invested 70 years worth of money, billions and billions and billions and billions of dollars. We've gotten a very good return on our investment, which is why the right wing doesn't like it. They are really ignoring the evidence. If you have a problem with wait times ... Another problem I think the VA has in spade, is huge micromanagement at the top. I've seen a lot of poor management practices at the VA. I've seen a lot of poor management practices in private sector healthcare. Why do they have shelves and shelves and shelves of management leadership books. We've solved the problem? Eric: I think it's fascinating, too. A large portion of where the VA delivers its care is in rural areas where access to care in the private sector, especially mental health ... Try to get mental health services in rural areas, outside the VA system. It's hard within the VA system. Outside the VA system, it's shockingly poor. Suzanne: HERSA did a study that showed that 55% of America's counties, all of them rural, have no psychiatrists, no psychologists and no social worker. None. So, you privatize mental health care, there is no place for you to go. The RAND did an independent assessment for the VA Commission on Care. They said there's no specialists in many areas where there are wait times and shortages for patients to access. Primary care is a huge problem in the United States. The U.S., unlike other industrialized countries, produces maybe, 15-20 percent primary care providers in its medical education system. There's a huge primary care shortage. I personally, tried to find a primary care physician in the East Bay, another primary care doctor, because my doctor left practice. I went on Healthgrades and Yelp and all the places you go. Every single practice that I went to, that had a high grade, was closed. Alex: I had that same issue. I tried to find a primary healthcare provider and the private sector is incredibly hard. Eric: ... let alone someone who you feel like this person has good ratings. Suzanne: Yeah. They're not there because we have a huge shortage. I'm very worried that if we start channeling more veterans into the private sector, that this is going to put a strain on the systems. You're going to pit veterans against civilian patients. That will be very true in rural areas if some of the proposals that are in Congress see the light of day. They are proposing to offer higher than Medicare rates to providers in rural areas. If you're Joe doc, and you could see Joe Smith, non veteran out there, you'll make 10 bucks less and then you can see James White, veteran. Pretty soon, the veterans are going to push out the regular people, regular patients, who don't have VA care. That could be a very nasty picture. Eric: What would dismantling the VA system look like? What it feels like is this slow burn. You just put in less money in the system. Whatever money you put in the system, you focus on non VA providers, providing that care. Eventually, with less people, less money going into the system, the quality of care will decease to the point where you will have the argument, "Well, the quality of the VA care is sub-par. Let's completely dismantle the system." Do you think that's how it's going to go? Suzanne: Yeah. I think that people have to really understand because veterans don't want the VA privatized. Most people don't want the VA privatized. What they think about it in terms of privatization is, "It's Friday afternoon. Fort Miley closes and we have an auction and we sell it. On Monday, it's open and some private sector provider runs it." That is one option and the most conservative people like the Concerned Veterans for America and a group led by Toby Cosgrove, the CEO of the Cleveland Clinic and some other people. That's of what they would like to have happen in the next 20 years. You can privatization that is this kind of salami kind of privatization where first you get rid of optometry and audiology. Then you get rid of dentistry and then maybe primary care isn't our core mission. We get rid of that. Eric: All the things the big hospitals don't like to do anyways. Suzanne: Right. Yes. There are many ways to do it. I think you see them all operating in Washington, now. You demonize healthcare workers in the VA. Their all terrible. You need to fire them on the spot. Never mind the fact that 100,000 are veterans. It's really interesting to me, because I work in patient safety. The worst problem in patient safety, in patient medicine ... they are saying all the professions ... is this culture of blame and shame. "You made a mistake. You're out. Don't say a word. There's no excuse, etc., etc." There's actually a movement around patient safety in the broader healthcare system, around what's called Just Culture. It's where you're trying not to do that. So people can say, "I made a mistake," and mistakes don't go underground. You learn from them. What's going on in Washington, is exactly what you do not want to happen to have a safe healthcare system. Ultimately, these people in Congress are managing a healthcare system. Right? This is the nations' largest healthcare system. It's one of the largest in the world. It isn't the largest in the world, but it's one of the largest in the world. You don't want whistle blowers. You want problems solvers. You want people to speak up. You want a nurse to tell a doctor, you're about to give the wrong med or the wrong dose. You want a transport worker, like they did in Pittsburgh, with this MRSA bundle, to say, "We really have to think about how we're transporting people who might have MRSA or an infection". You want them to be able to raise their voices. You do not want to create a punitive environment. Obviously, you want to get rid of people who are not trainable and intractable. This is not good patient safety leadership. It's privatization leadership. You're attacking the public sector people. You're attack the unions. You don't pay adequate salaries. You create a sense of instability. If I'm thinking about, do I want to work in private care at the VA or do I want to get $40,000 or $50,000 or $100,000 more and work somewhere else? Not only are they going to get more money, they're saying the VA is in critical condition and a mess. Why would I want to work in a place that's a mess? It's very important for veterans to understand. I think a lot of them don't. Even VA employees to understand that there's this attack going on. A lot of people think, "Oh, they'll never do it." Well, look what they did to public schools. There's a lot that they can do, if people don't fight. Eric: So what should healthcare professionals that have trained in the VA system, they may be working in the VA System, they may not, but they have an affection from their training ... What should they be doing if they care about the VA system? Suzanne: If they care about the VA system, and they care about healthcare in general, they should understand that the VA system isn't just for veterans. As you pointed out, you're training 70% of the nation’s physicians. You're training them not just how to give meds and what dose is the right dose. You're trailing them in teamwork, you're training them in geriatric care, you're training them in palliative care, you're training them in mental healthcare. Those models will be lost to the broader healthcare system. The VA does ... and you're training PTs and OTs and all kinds of other professionals. I have been deeply impressed by the models of palliative care, geriatric care. As I said earlier, things that I wish I would receive when I'm sick and old ... I'm getting there, old at least. I don't have a hope of receiving them in the private healthcare system. It costs too much. Also, VA physicians are on salary so they don't have an incentive to over treat and throw all this stuff at you at end of life, or even in the middle of it. We will lose that. People have to look at the VA and understand, it's not just about veterans. Of course, it's about veterans and we owe veterans precisely what we're giving them. A system that's trying really, really hard, sometimes against all odds, to serve them well, and that largely does serve them well. We all have to fight for the VA. I think it's pretty simple. Pick up the phone. Call your Congress person. Say you don't want the VA to be dismantled. Where are the bills to strengthen and improve the VA? Where are they? Why don't you write one, Johnny Isakson? Eric: That's good. I'd like you to get to read a little bit from this book. I think we've basically picked out a similar passage. This is a section about mindfulness training for veterans. Suzanne: The twelve-week mindfulness training I'm attending takes place in distinctly different setting that the usual urban setting. It's held in a conference room in building eight, the behavioral health building at the San Francisco VA, at Fort Miley. The group of veterans in their fifties and sixties who come here are not here for an intellectual or spiritual exercise. For some of these men, becoming better able to control their thoughts and anxieties through mindfulness is literally, a matter of life and death. Dressed in spanking fresh jeans and a starched white shirt, Harvey holds himself steel rod, straight. He speaks deliberately, each word clip, sharpened, as if surrounded by barbed wire and warning signs advising people to keep their distance. His cross to bear is obsessive compulsive disorder along with 10 years of being homeless. Ronald, an African American veteran, is almost his opposite, supple, fluid and easy with jokes. Yet, he is experienced similar struggles with homelessness, poverty and divorce. James has struggled for years with panic disorder. He will find himself in a supermarket or on a bus, suddenly overwhelmed with anxiety. He feels he will have to get out, right now, or he will die. Eric: That's great. So, Eric and I both work in the VA and we know that when we work with journalists, often, we have to go get permission to work with them and sort of, go over the outlines of what we might talk about. Is that something, when you were planning on doing this book ... I'm sure you worked with the VA Press Office and Central Office, as well. We're there any constraints placed on your reporting? Suzanne: No actually, not at all. The only constraint has been when I've gotten in when they said I could get in, that we had to ask patients permission for me to be there observing, or ask patients if they'd talk to me. I'll tell you a really funny story about how willing patients are to talk to me. I have almost never been refused. Maybe once or twice over the past three and a half years. But I was sitting ... Okay, wait .... let me. I think that the issue of public relations and the story about the VA getting out, I think at the very top of the VA hierarchy, there's very, very poor, in my experience, public relations efforts to let people know about the system. They're up against a lot of odds. Most VA healthcare systems have one, two, three, maybe people in the public affairs office, whereas the academic affiliates that they are working with will have 50, 100. They are out there promoting all this stuff. The VA could do such a better job of promoting itself. You're doing so much amazing stuff. There's a failure to explain that this isn't just for veterans. The models that you're developing, the research that you're doing is for all of us. When you show the efficacy of palliative care and geriatric care, you're not just saying that there's little bubble of veterans that die a certain way and that isn't applicable to all other Americans. It's really important to pitch the VA, which is why I'm so interested in the VA, and passionate about it, as something we all benefit from. It's developing models of care that only other European healthcare systems and other national healthcare systems develop because of the alignment of the correct financial incentives. There is a bit of a problem with censorship. People in the VA are not tooting their own horn enough. They need to have more conversations with family members and friends and churches and everywhere they can. The thing that you have to show is what you're doing is not just for veterans. It's for all us. That's really important. If we lose the VA, we lose models of care. All of us lose these models of care. It's not just veterans that are going to suffer. Eric: We lose one of the most important educational venues out there in the U.S. and research venues putting out exceptional papers. Not just on models of care ... You talk about prostate cancer and all these other important research articles, coming out of this system. Suzanne: You have the Million Veteran Project or program, which is looking at genomics and its impact on health, the shingles vaccine, the first implantable heart pacemaker, on and on and on. I wanted to tell you this story. I'm not sure if you can put it in. I was sitting downstairs in Fort Miley, the VA hospital in San Francisco. I was at lunchtime and it was very crowded. A veteran sat down next me and asked if he minded if he joined me. We started chatting and I told him I was writing a book about VA healthcare. He said, "Oh my God. You've got to go over to City College to their Veterans Resource Center there. They helped me so much with my bipolar disorder. I can't tell you how much they helped me." I wasn't going to ask him about his bipolar disorder. Then we started chatting and he's telling me all about how wonderful these resources are for him. A guy next door listens in and says, "Oh, come on. You have to come over and talk to me." He starts telling me, "I have PTSD and I was beating my wife. I went to the VA. I came here and I'm doing all this therapy. Now, I'm not beating my wife anymore and she's so happy." Then another guy walks by and hands me a napkin with his phone number on it. What I felt was, this was really amazing. What the VA has done is create a safe place for people who feel they can approach a journalist and say talk to me about my mental health problems. This is just unimaginable in any other place I've ever reported in. That shows the extraordinary accomplishments of this healthcare system. Eric: Wonderful. I want to thank you for joining us today. Alex, do you want to end with a little bit of a song?